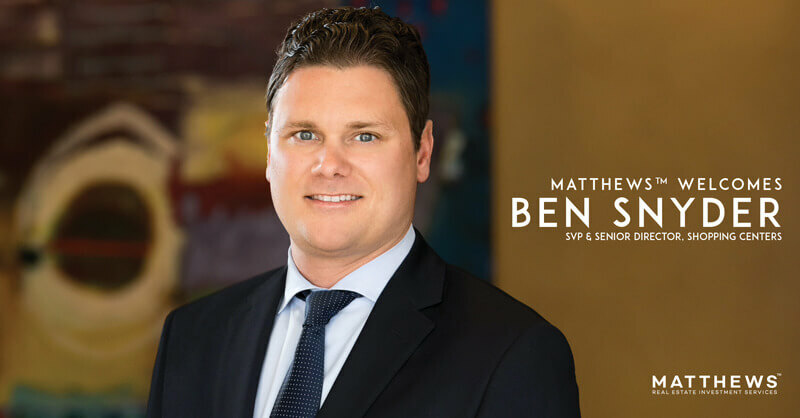 Los Angeles, CA – Matthews Real Estate Investment Services™, the nation’s fastest-growing commercial real estate company, announces the high power addition of Ben Snyder as Senior Vice President of Matthews™ Shopping Center business. Snyder will focus on expanding the firm’s overall investment sales in the Midwest, as the company establishes a new office in Cleveland, OH in June 2018. Snyder brings almost a decade’s worth of commercial real estate experience to Matthews™, most recently served as Vice President of Transactions at DDR Corp. In continuation of the company’s aggressive growth strategy, Matthews™ is slated to open offices in Austin, TX and Atlanta, GA later this year.